CLICK HERE to see full-screen version of Wind Plot. The Battle of Nations begins. Today is Day 1 of international team competition at the 2017 F-Class World Championships (FCWC) in Ottawa, ON, Canada. Talented teams, in their nation’s colors, will be competing for glory and national pride. Past F-TR USA Nat’l Champ Bryan Litz was wind coach for the winning 4-man LUM F-TR Team at the 2017 Canadian F-Class Championships, which preceded the FCWC Worlds. 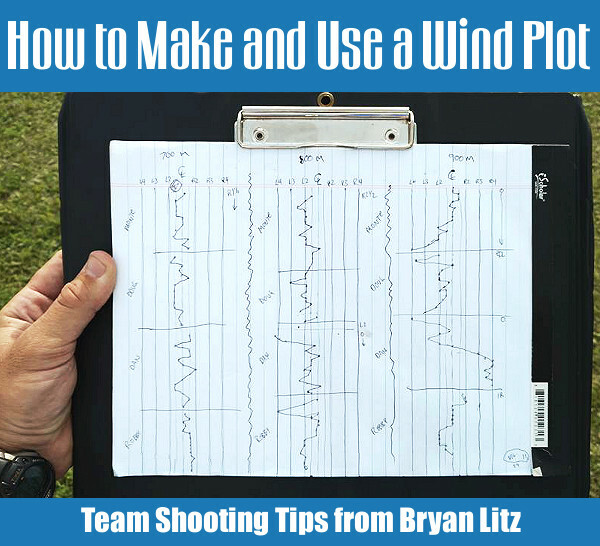 Here Bryan explains how he uses a Wind Plot to make better wind calls, helping his team-mates maximize their scores. 1. I always look for blocks of stable conditions to shoot in and wait out the rest. 2. If the wind plot shows drastic changes, either I’m not picking the right time to shoot or it’s just a really unstable wind condition. 3. When you see many shots using the same hold (e.g. Robby’s 700m and 900m strings on plot), it can indicate very fast shooting and fast pit service. Q. What are the numbers and Markings on this Wind Plot? Litz: The wind plot represents the rings on the target. Left 2 for example, is the 5 line on the international target, while Left 2 is the 10 line on the USA target. F-Class shooters and coaches talk about wind holds in relation to these rings. A Left 2 hold isn’t left 2 MOA or 2 MILS, it’s the second ring from center. The vertical lines on the plot represent the rings going out from center, 4 or 5 in each direction. A left or right 5 hold is edge of black on the int’l target. Q: What Does this Specific Plot Reveal? 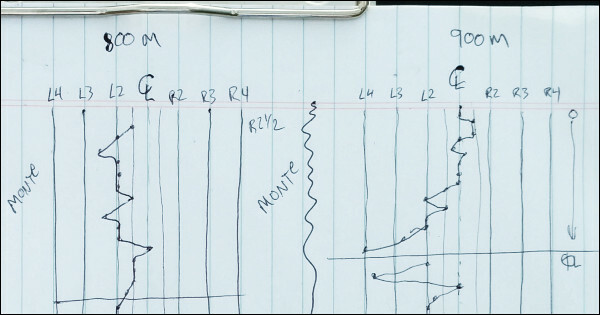 Litz: Looking at the plot, from left to right is 700m, 800m, and 900m that we shot progressively through the day. Top to bottom shows each shooter in sequence (shooters names are shown by their blocks). To the right I note what was on the gun for that shooter, and note when it changes. Often times we run the same wind on the gun for several shooters but if it changes, I note what the new windage is and continue on. For example if we’re settled into a condition where we’re shooting Vs with a right 3 hold, I might adjust the scope 1 MOA right because a right 3 hold is equal to 1 MOA. So we can move the scope and start shooting with a center hold. Q. Are you Plotting Where the Bullet Hits? Litz: Not exactly. This kind of plot IS NOT specifically showing where the bullet hit, and IS NOT showing what the shooter held. It’s showing what the shooter should have held to center each shot. IMO, this is the most valuable information to have when guessing where to hold next for each shot. On each shot, the shooter or coach takes a guess about where to hold, and fires the shot. 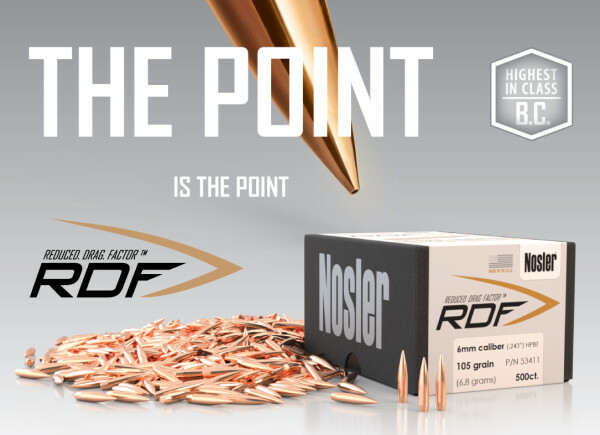 If the bullet hits the center, you plot the point right where you held because it was the correct hold. However, if you miss the call, you plot what hold was required to put that shot in the center. For example if you shoot a right 3 and hit where you held, the correct call would have been “center”. In this way, you’re building a history of what you should have done, which may or may not be what you actually did. This shows you the trends, and brackets which can be used to make future decisions. Q: Is this Type of Wind Plot Something New? Litz: I didn’t invent this method, it’s been around a long time. Vertical can be plotted the same way. 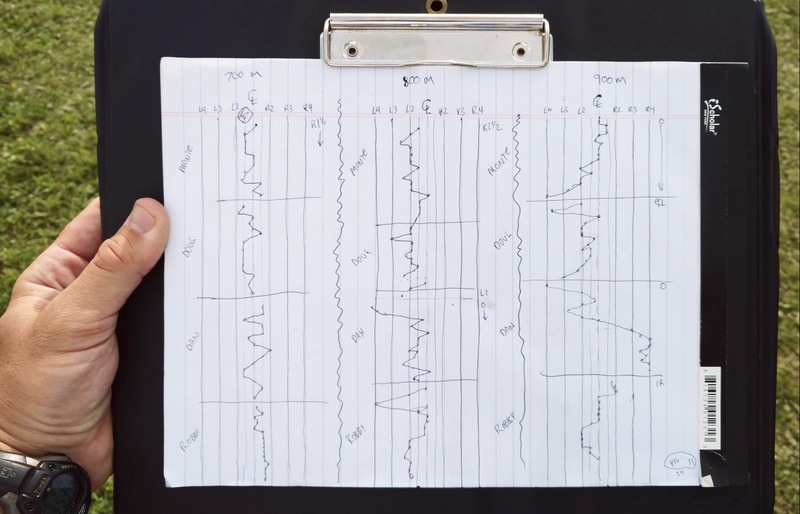 In team matches, we have a plotter who is advising on elevation trends and suggesting corrections. But, as wind coach, my job is the horizontal so I only keep the wind plot. I have learned lots of strategies from my coaches Emil Praslick and Steve Hardin. There are many ways to plot and many standard work sheets for this. They’re all tools and the key is to find something that works for you in different situations. I don’t keep a plot when I am personally behind the trigger string firing because I lose more points when I take the time to do it vs. just shooting fast. When pair firing or coaching, I can keep the wind plot without compromising the shooting. Team Australia used plots and comms linking coaches to help win the 2013 F-Open Team World Championship. We expect other teams will follow suit in Canada in 2017. Know your goal of plotting. The simplest plot is where you write the shot number where it hit on a target face. This kind of plotting is useful for evaluating shooter performance because it shows how big the group is (in particular the vertical dispersion). However keeping a plot like this does little to help you figure out the wind. It just shows you what shots you messed up on. It does nothing to help you find the center. [Editor: That’s a whole different matter with many variables.] The wind plot I use is a running history of what the correct wind call was for every shot fired. The more you shoot, the more history you have in a condition, and I find that very useful information. 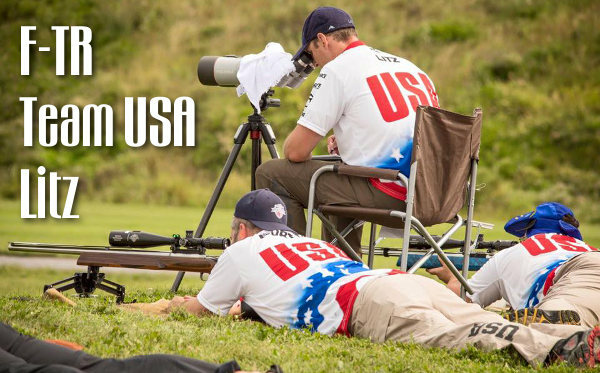 Share the post "Match Shooting Strategies — How To Use a Wind Plot"
Wouldn’t it be great if you could have one match rifle that could do double-duty — shoot position matches (with sling), and then function as an F-Open gun with front rest? Now that’s possible with Gary Eliseo’s clever “PickleFork” accessory for his line of tubeguns. This accessory also works great for load testing and varmint hunting. Competition Machine’s Gary Eliseo is a very smart designer as well as a talented shooter. 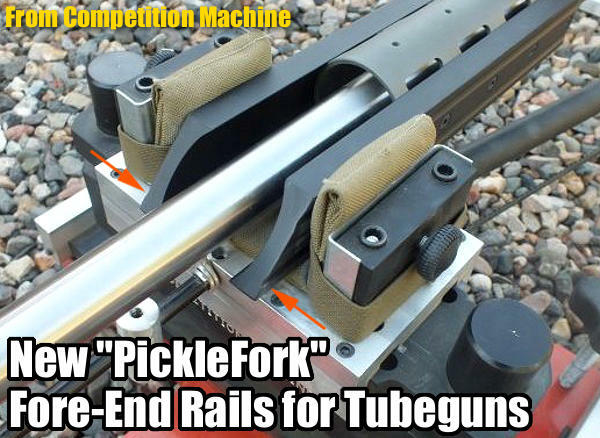 The inventor/builder of the popular Competition Machine Tubegun chassis systems, Gary has come up with something new, which he calls the PickleForks. These are rails that fit to the sides of the tubular fore-end/handguard on his chassis systems. 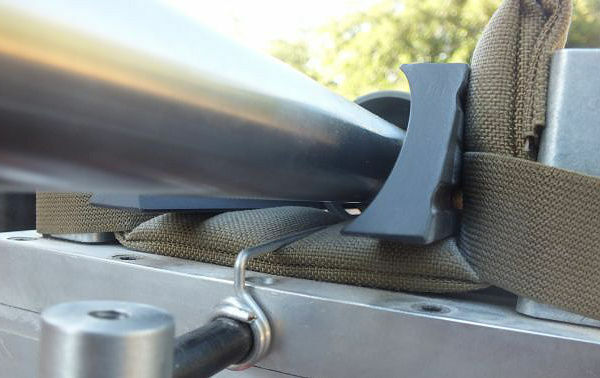 This allows you to use a pedestal-style front rest for F-Class competition. It also provides a much more stable platform for load testing, varmint hunting, or any kind of rest-assisted precision shooting. 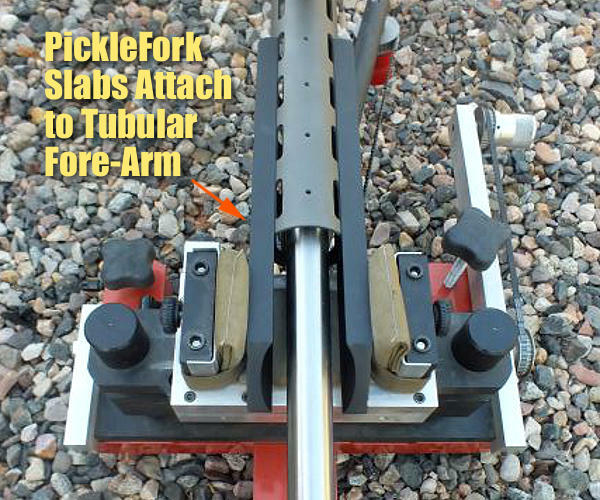 These PickleForks transform a Tubegun into an ultra-stable, straight-tracking rig when used with a competition-style front rest. Gary explains: “Now you can have the same super low-boreline, long ‘wheelbase’ and vertical sides of our innovative F1 F-Class chassis system for your tube chassis. The new PickleForks attach directly to the sides of the F-Class/Tactical fore-ends, no modifications are required. 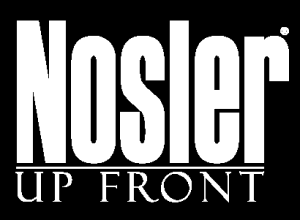 They are very rigid with no flex or twist and make the rifle track like it’s on rails.” The new Eliseo Competition Machine PickleForks are offered for a very reasonable $70.00 per pair, with Cerakote finish. (You get two metal units, one for each side of the fore-arm). For more information, visit www.GotXRing.com or call (928) 649-0742. Share the post "PickleFork Rail Accessory for Eliseo Tubeguns"